What you see above is two years of vegetable scraps, dried leaves, brown paper bags, toilet and paper towel rolls, and egg cartons sifted into a wheelbarrow. 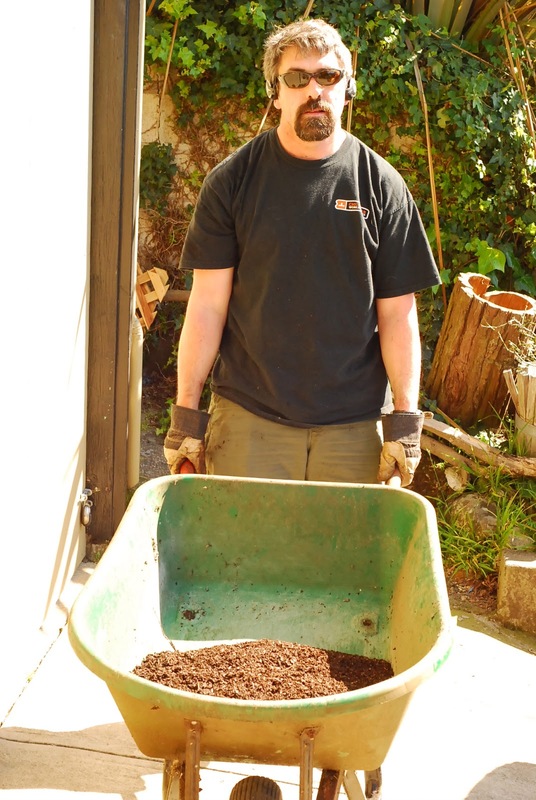 The compost is teeming with roly poly bugs and an occasional gross worm-like thing. (Millipede?) Here's hoping that this will result in a snap pea bonanza! I'm amazed at the small yield considering how much scraps we generated every week. Between the compost and the worm farm, scraps get consumed around here. This compost was destined for the front yard garden after we took out the German radishes and aphid infested kale. Growing greens in the summer is harder for us since a call out goes to all the bugs in the area that there's an all you can eat buffet in our front yard. Apparently, the deer know it now, too. Besides sugar snap peas and a collard tree, we're unsure what to plant. The reason we are unsure of what to plant is partially due to our Fully Belly Farm CSA - we don't want to grow things that are redundant to our farm box. Although we can grow radishes, I don't necessarily need to eat loads of them and we usually receive a bunch a couple times a month. Plus spring and summer are times to plant the alluring vegetables like tomatoes and snap peas, vegetables that taste best fresh off the vine. That being said, we'll probably plant more carrots since the royal chanteys are a sweet treat and pest resistant. I would plant more greens like chard, bok choy, and kale, but last summer we had loads of leaf mining insects. I should probably look into organic ways to control those pests because we go through a lot of greens. If you have any suggestions for what to grow or natural pest control, please let me know in the comments. As mentioned before, the ants have infested our kale with gray aphids. I picked the last of the leaves, inspected them carefully, and chopped them up for a raw kale salad. I know it seems fussy to some, but I love to massage my kale salad. I can sit and veg out while I'm massaging the kale - no need to moderate heat or get a pot or pan dirty. I can do this all in the serving bowl. Just put some crunchy salt, a little oil, and a little acid into the bowl and massage for as little or as long as you want. I taste as I go, so when the kale is sufficiently supple and sweet, I stop the massage. Sunday's dinner was a massaged kale salad with segmented oranges (I got a new knife, or "sword" as the boy calls it) and braised lamb necks. Lately, since I'm trying to figure out more one pot cooking, I've been throwing a few handfuls of wheat berries and more water into the braise about 45 minutes before serving time. The grains turn out flavorful, and any leftovers are destined to be a bed for my poached or fried egg breakfast. And abruptly transitioning onto the subject of knitting, if anyone is interested in buying some Hiya-Hiya interchangeable needles, I have both the small and large sets for sale. The large set has never been used. I'll probably put them up for sale on Ravelry soon, but if this is something you're looking for, lemme know and I can give you more details and pics! They are the 4" steel tips (not the sharps). $45 for the small set, $65 for the large set, or $100 for both. Paypal payment please, and free shipping in the US.